For Descant Recorder and Piano. 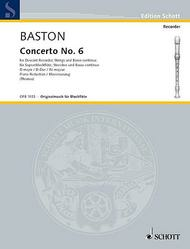 Composed by John Baston (1711-1733). Edited by Bernard Thomas. This edition: Saddle stitching. Sheet music. Originalmusik fur Blockflote (Recorder Library). (Orchestermaterial s. Rubrik: Blockflote, Streicher und Klavier). Piano Reduction with Solo Part. 16 pages. Duration 3'. Schott Music #OFB1033. Published by Schott Music (HL.49011192). The thoroughly edited scores follow essentially the first edition printed by John Walsh in London in 1729. 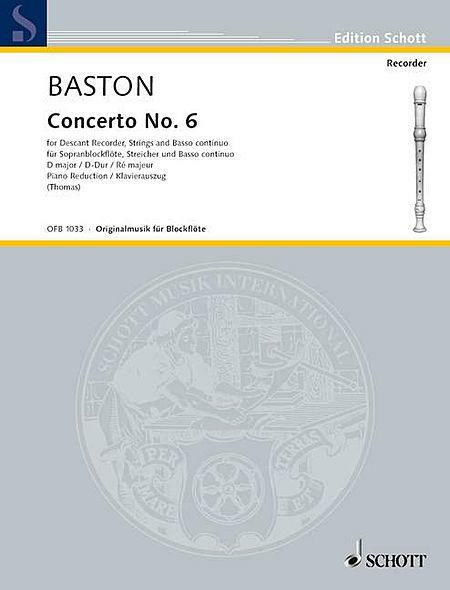 Baston was regarded as an excellent recorder and flute player who worked with London opera orchestras in the early 18th century. His easy concertos anticipating the elegant melody of the early classical period enjoy great popularity representing a rewarding task for music school orchestras and advanced recorder players.